Michael Smith and Mark Boyd were impressed with what they saw during a tour Thursday afternoon of Goodwill of the Southern Alleghenies’s store along Eisenhower Boulevard in Richland Township. The two were among nearly 60 representatives of eight Goodwill Industries agencies that serve all of Pennsylvania and parts of adjacent, who are in Johnstown for the 2014 Pennsylvania Association of Goodwills Annual Conference. Photo by John Rucosky. 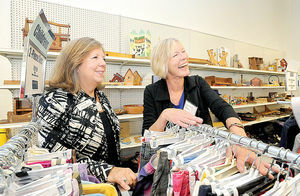 Wendi Copeland of Goodwill Industries International (left) and Phyllis Bandstra, president and CEO of Goodwill of the Southern Alleghenies, tour the local agency’s store in Richland Township on Thursday. The two-day conference, hosted by Goodwill of the Southern Alleghenies, ends today. Boyd, president of Goodwill Industries of Southern New Jersey and Philadelphia, described the Richland store as awesome. Boyd said he was impressed with how the donations area is arranged and how the process to get donations out to the sales floor works. Boyd also was impressed with the musical welcome they received at the store. Four members of the Johnstown Symphony Youth Orchestra who play bowed string instruments – Zelie Eger, Lauren Sprock, Kaylee Shook and Joseph Eger – were invited to provide background music for the tour. Smith, president and CEO of Goodwill of Southwestern Pennsylvania, said the conferences are informative, with representatives working on solutions to concerns facing Goodwills. “This is a very impressive store,” Smith said about the Richland location. “I like the (Goodwill) mission banners and will take it to my Goodwill. Phyllis Bandstra, president and CEO of Goodwill of the Southern Alleghenies, said the store is a platform for Goodwill’s mission. “We use the money we raise here to further our mission of helping people get jobs,” she said. Wendi Copeland, senior vice president of strategy and advancement for Goodwill Industries International, Rockville, Maryland, said the Goodwill of the Southern Alleghenies is a true social entrepreneur. “They’re taking the clothing and household goods that people used to love to create jobs and other opportunities for people to take better care of their families,” she said. Frank Sojak is a reporter for The Tribune-Democrat. Follow him on Twitter @ FrankNews10.